Wow, I ADORED this idea! And it has neat execution and nice graphics too! However, there are places where it's quite a bit unintuitive. It's completely intuitive to get him to keep going somewhere, but, for instance, if he's going somewhere and I start punishing the "go", and let's suppose he sees nothing. What DO I want him to do? Take off? Turn? And what if he takes off, and I favour that, am I saying "Yes, I did want you to take off in this istuation" or "Yes, keep doing that"? Because when I reward the parrot for turning to the proper place, he interprets it as "being rewarded for just turning". That's actually part of the fun in this instance - just keep him spinning while I think! 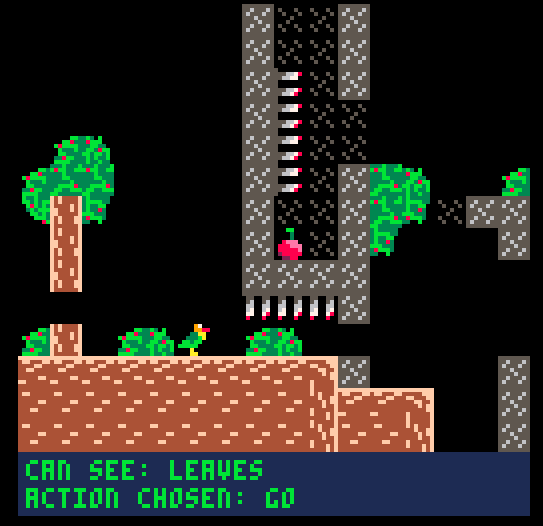 Bit of a "bug turned feature" situation in a game design standpoint. However, the issue is when this happens with OTHER stuff. It's specially frustrating when there are only two blocks to manuever and you have to hope that the parrot will understand that, as soon as he land on the block (because he needs to, there's no ther way), I WILL NOT want him to go forward OR turn. You've made an idea that has HEAPS of potential and you can build on it for a long, long time. But you've also "shot yourself in the foot" of sorts: You're making an AI. 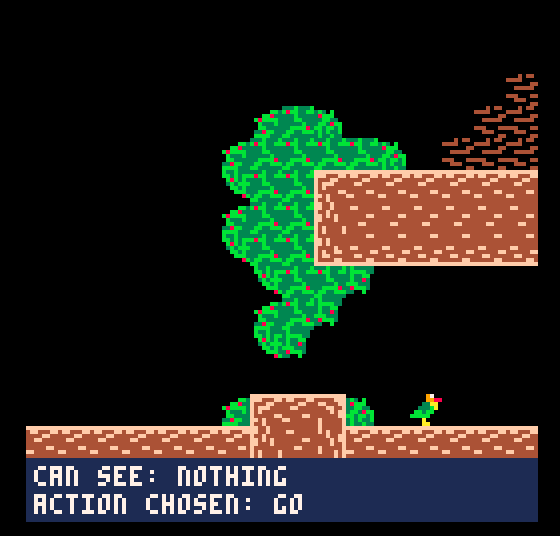 You're making a game about machine learning. Even if it's a simplified version. That's both amazing for a game jam - but also terrifying to think about keep working on it. Still, kudos - it works, it's beatable, it's inventive and you've done it all in a jam! I think the idea is really good. It just doesn't lend itself very well to this type of game since the parrot needs to learn different reactions to the same things all the time which makes it pretty hard and in the end kinda annoying to control. Fascinating! 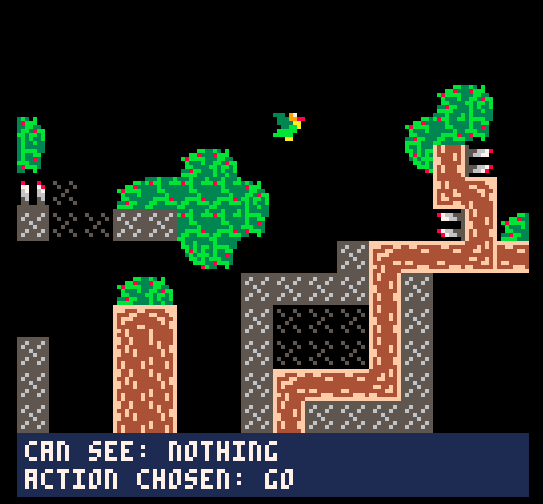 Making a game around machine learning is awesome :) I did find it tricky to control the parrot, but that is obviously the cost of machine learning. Good job! Good Game !! an interesting idea with good concepts ! Nice game! A bit annoying, tho, because sometimes I want the bird to go when seeing wood, but sometimes I want him to fly. Would be nice if you could make a difference between the floor and the wood in the background! Also, would be nice if the bird waited for feedback before moving, and you could choose not to give any by pressing a different button. Would make the game way less frustrating! Thanks for your feedback, especially on the art (I'm a programmer by trade)! That's a good point about there being no feedback between states, I'll be sure to take a look into rectifying that. Love the core idea, though the game itself was too frustrating for me to enjoy it. Still think there's probably a good game in here, I hope to see you try new things with it in the future. Sometimes a bit frustrating when accidentally giving a wrong stimulus, or the correct one not showing up, but the checkpoint system was forgiving in a really really nice way. The way how you use the four different "parrot behaviour states" through what it sees is ingenious, and really makes you plan out a screen in advance. On top of that it was very noticeable that you kept those four states in mind so that during more difficult sequences you don't have to change it's behaviour anymore. I'm glad you noticed that I tried to tie different 'sights' to different actions on each screen, in fact I feel like I should have gone further with that idea and probably will redesign the levels a bit in the future to double down on that idea a little more. I agree it can be frustrating - some other comments have suggested making it turn-based which I might toy with. A part of me wants to keep it this way to preserve some of the comedy, but maybe there's a best of both worlds. This is a hilarious game that is so existentially infuriating that I love it. Feels like a similar idea to PacMan 2 for the SNES. Hilarious, frustrating that turn left and turn right are the same, this parrot is truly foolish (not a bad design). Haha yeah I certainly considered making turn left and turn right separate actions, maybe I'll try that out. Thanks for the comment! Yeah, I agree with acoto87. It's a good concept, but it has a problem of pace: when it is moving, it is too slow, when you want to reward/punish an action, maybe the action changes all of a suden and you rewarded/punished and action that you didn't want to. And manually changing the speed all the time is no fun. So yeah, it shoud either be turn based, or it should slow down when there is a moment of learning (when you have to reward/punish) and everything else at normal speed. Yeah those are totally fair points. Making it turn based I think is the best solution to those issues (I wish I'd have thought of this!). 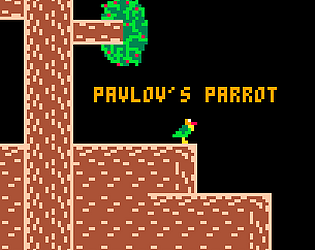 If I pause after each action for input and make the movement a bit faster that gets around the problem of having to wait for the parrot to walk across a longer stretch of the screen as well, since you can hammer the key quickly if you want. Thanks so much for playing and sharing your thoughts! That's a very good point, and something that would be relatively easy for me to change. Thanks for the feedback!